In this first book of the series, readers are introduced to a lovable little alligator named Dozi. Living in a swamp in central Florida, Dozi observes wondrous colorful lights over a distant amusement park. Eventually, the curiosity of the little alligator gets the best of him and he heads off to discover the strange and fascinating new world of humans. While hiding inside one of Orlando’s popular theme parks, Dozi makes the decision to stow away in the unsuspecting Hoxwinder family’s minivan after the family has finished visiting the park. During the long over-night drive home from Florida, Dozi befriends young Byron Hoxwinder in the very back of the vehicle. The family arrives home without anybody but 9-year old Byron Hoxwinder realizing they have brought a young alligator home with them. So my 6 year old (GB) picked up this book when I dragged she and her sister along to One More Page Book for for the Boldly Bookish Tour. Sidenote: Where I met A.C. Gaughen, the author of the Scarlet series (YA) which I ADORE! When we got home she begged me to read it and we fell in love with this adorable alligator and his adventurous spirit. I loved the tempo and rhythm of the book as we read it. It has a rhyming and playful tone that will draw in younger children and the illustrations by Nicola Sammarco are simultaneously calming and bright all at once. Children will have such a wonderful time looking at all the emotions that show up on the page, this is a book that even non-readers will love because looking at it is just as much fun as reading it. Dozi is a young alligator living in the Everglades who watches beautiful lights appear in the sky every night ( being the Disney World fanatics we are, of course our mind went straight to Disney's nightly firework display.) and wonders what about it has everyone so excited. So the curious alligator starts off on his adventure and decides that this new world he has found in kind of amazing and full of new things he wants to learn about and see. There are really just so many good things to say about this book. It should be a staple on any child's book shelf and in any early childhood educators classroom. 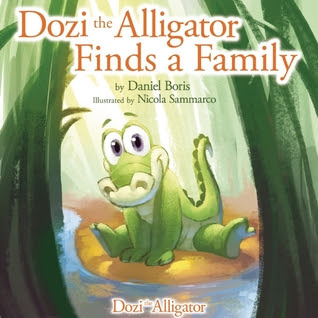 I would love to see Dozi's story as a 'big book' with preschoolers gathered around eyes wide taking in all the color and the story of this curious alligator. This would be an easy book to also get you children involved in the story, pretending to be Dozi, hiding and scurrying about. The best part, this is a series. When GB discovered that there is a second book that will continue the series, her fist 'true' series she was so excited. She pumped her fist in the air and shouted out "Yes, I knew I picked the right book. Isn't this awesome mom?" For a burgeoning reader with an older middle grade reading sibling it is everything that she can say she has her very own series to read, just like her sister and parents! This is a fun story full of wonderful illustrations and magical moments that any reader will enjoy. If you have young children at home or at school this book should be a staple on your shelf!